Two years after a CIRES and CU Boulder team discovered a previously unknown class of waves rippling continuously through the upper Antarctic atmosphere, they've uncovered tantalizing clues to the waves' origins. The interdisciplinary science team's work to understand the formation of "persistent gravity waves" promises to help researchers better understand connections between the layers of Earth's atmosphere–helping form a more complete understanding of air circulation around the world. 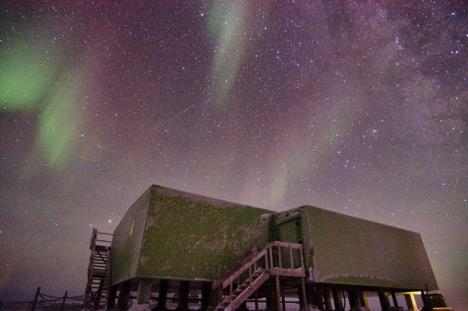 "A big picture of Antarctic gravity waves from the surface all the way to the thermosphere is emerging from the studies, which may help advance global atmospheric models," said CIRES Fellow and CU Boulder Professor of Aerospace Engineering Sciences Xinzhao Chu, lead author of the new study published today in the Journal of Geophysical Research – Atmospheres. "The new understanding results from a series of journal publications, based on multiple years of lidar observations, many made by winter-over students, from Arrival Heights near McMurdo Station in Antarctica." "The upper-atmosphere waves are huge, with a horizontal length of around 1,200 miles (2,000 km), and the lower, stratospheric waves are much smaller–only 250 miles (400 km)," said Jian Zhao, a Ph.D. candidate in CU Aerospace, working in Chu's group, who stayed the 2015 winter over at McMurdo for lidar observations. Zhao and colleagues previously described the stratospheric waves in an earlier study, and he is second author on the new study which describes how the wave energy varies over seasons and years–documenting those kinds of variations is critical for researchers trying to understand how the waves influence things like global air circulation and climate change. The team suspects that when these lower, smaller-scale stratospheric gravity waves break, they trigger the formation of the huge waves that then travel to the upper atmosphere through a process called "secondary wave generation." Evidence from lidar data at McMurdo station pointing to this process was described in a paper published this year, led by Sharon Vadas, a researcher from Northwest Research Associates, and colleagues. Another possible source of the persistent waves is the polar vortex–a persistent pattern of wind and weather that rotates around the South Pole during winter, Chu and her colleagues reported in the latest paper. Chu and her research colleagues sometimes find themselves sitting at desks running computer models and calculations, and sometimes they are bundled head-to-toe, walking through strong winds and frigid temperatures well-below zero degrees F in Antarctica to run cutting edge lidar systems installed there. Two of her students–recent graduate Ian P. Geraghty and Ph.D. student Zimu Li–will travel to Antarctica this October to continue the research.